Tele-surveillance cameras as seen everywhere in Monaco. The Prinicipality has the reputation of being one of the safest in the world. This one is near to the Musée Océanographique on Le Rocher. 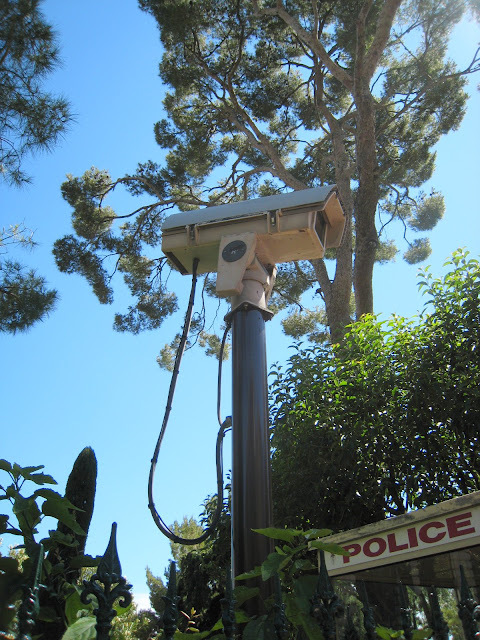 Do you have such cameras in your city and do you think they are a good idea? 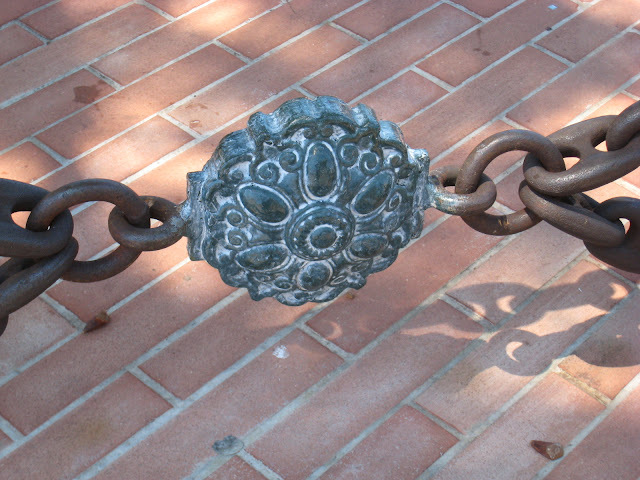 Beauty in the detail - part of the chain fence you saw in yesterday's post. This is part of the Place du Palais. On our right, but way out of view, is the Palace. (see yesterday's post). Behind us and a long way below is the Port of Monaco. Here's the right-hand corner of the Grimaldi Palace, home to Prince Albert. 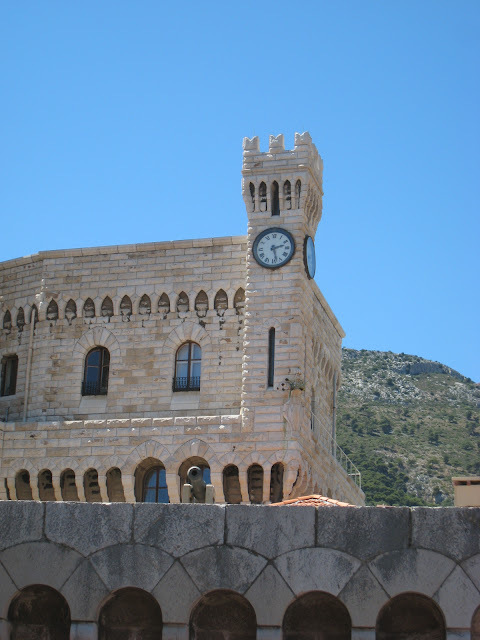 The Palace dates from the 16th and 17th centuries but still preserves its medieval towers, built by the Genoese in 1215. Francesco Grimaldi took possession of the fortress in 1297, and his successors enlarged it. 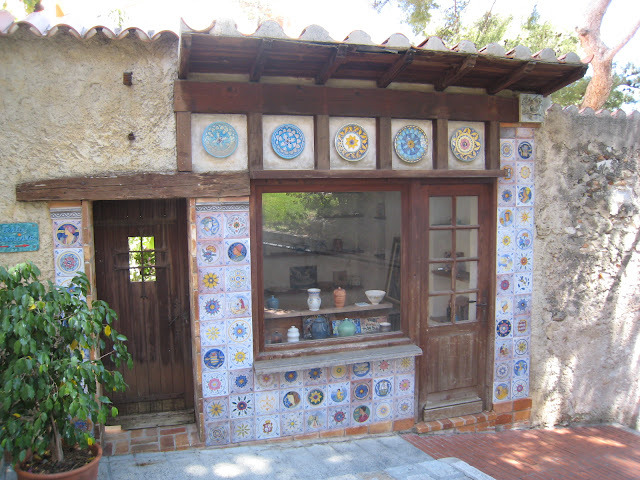 This pretty pottery shop/atelier is on a tiny road that leads from the Place du Palais to the Jardin Saint-Martin. The shop was closed and after peering inside and seeing its bare shelves, I got the feeling it might have closed down. 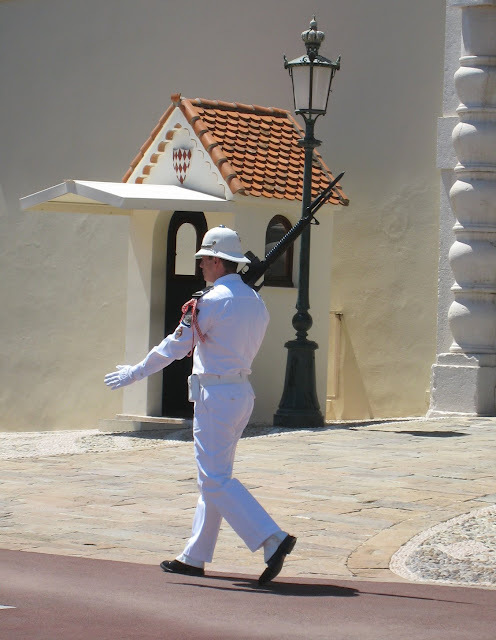 One of the immaculate Palace guards marching up and down. He'll soon go back into his little hut and stand guard. 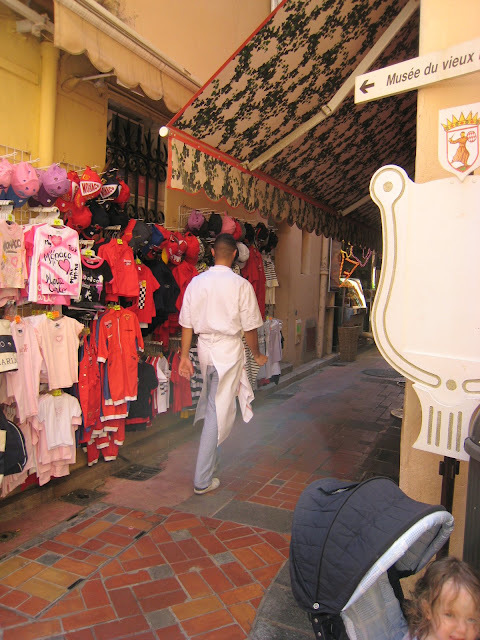 Shopping in Monaco isn't all luxury shops. 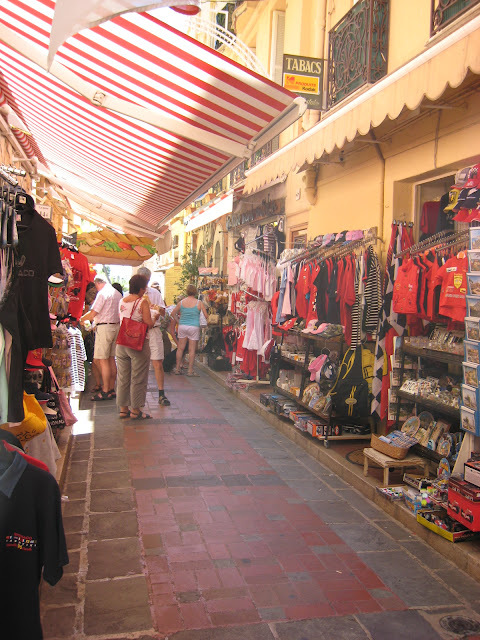 Here, on Le Rocher you'll find many shops that fulfil the needs of the tourist. If you continue to the end of this walking street, you'll find the Palace. 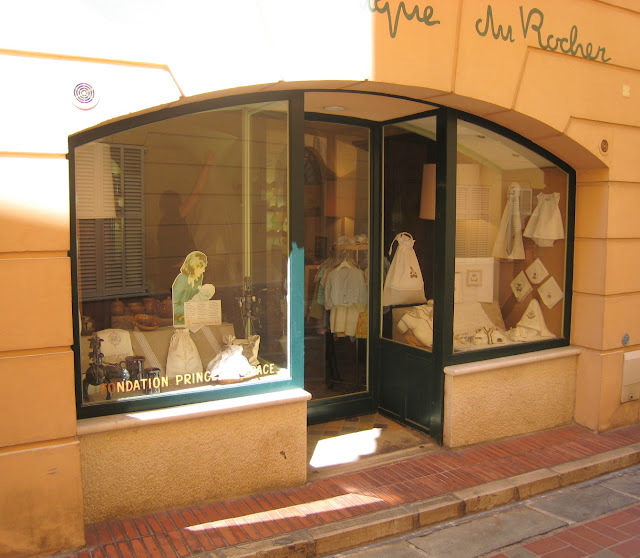 This boutique is one of two on Le Rocher, set up by the late Princess Grace as part of the Fondation Princesse Grace. 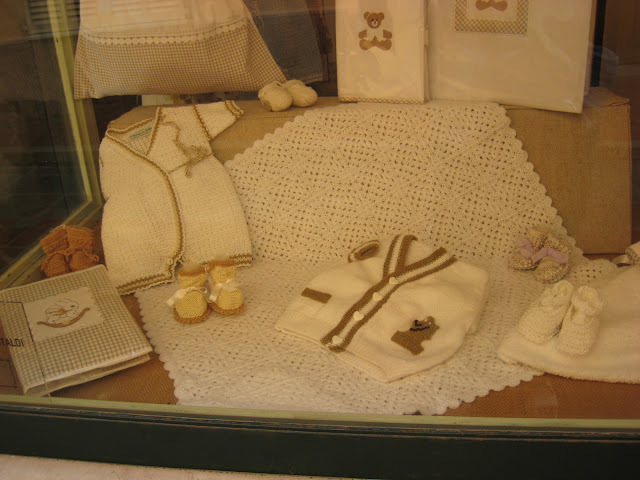 This one sells hand-made baby clothes - something you rarely see these days and quite beautiful they are too. It's around 11 in the morning and this young chef hurries back, through one of the tiny streets on the Rock, to the restaurant where he works. Here's the post office on Le Rocher. Apart from the poubelle (rubbish bin) it's rather nice, isn't it? In Monaco you buy a Monaco stamp. French stamps are not accepted. 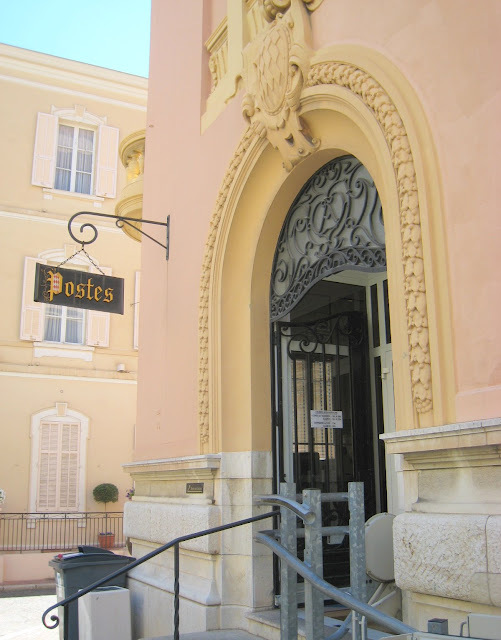 And whilst mailboxes in France are yellow, in Monaco they red - remember the Daily Photo Theme Day: a Public Mail Box. 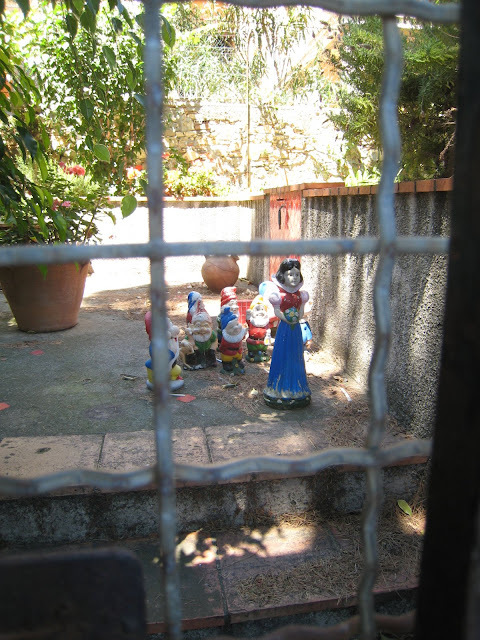 Down a narrow road leading off the Place du Palais, I peered through an old wrought-iron gate and spied Snow White and the Seven Dwarfs. Not what I expected in Monte Carlo! This is new Open Air Summer Cinema, just along from the Oceanographic Museum. It advertises as starting at 9.45 at night but normally it's 10 p.m. or later. You can buy a glass of wine, you can sit in lounges or chairs. The films are in English with French subtitles - and it's a great place to meet up with friends. Why not come tomorrow - they are showing Harry Potter and the Order of the Phoenix? It's rather magical setting I think you'll agree. Click on the website of the Summer Cinema, scroll down, and you'll see a map of exactly where this is on the Rock. 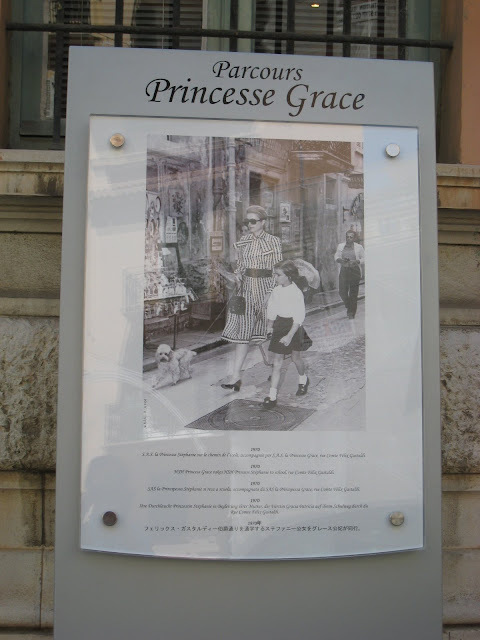 This year, for the first time, Monaco is holding an International-scale exhibition in tribute to the late Princess Grace. Held at the Grimaldi Forum and open from July to September it's called 'Les Années Grace Kelly, Princesse de Monaco' and is organised in close collaboration with the Prince's Palace, which has unveiled never before seen items (letters, dresses, jewels, fashion accessories, film, photos...), this exhibition retraces all the periods and facets of her life, from Grace Kelly, Hollywood star, to Princess of Monaco. At the same time, you'll find many beautiful photographs of the Princess displayed on the streets. The one above, taken in 1970, show Princess Grace taking Princess Stephanie to school, Rue Compte Félix Gastaldi. What do you do when you've got a load of spare cannon balls? Here's the answer! This is the Place du Palais (see yesterday's post) and is where you'll find rows of benches (with cannon ball support) under the shady trees. 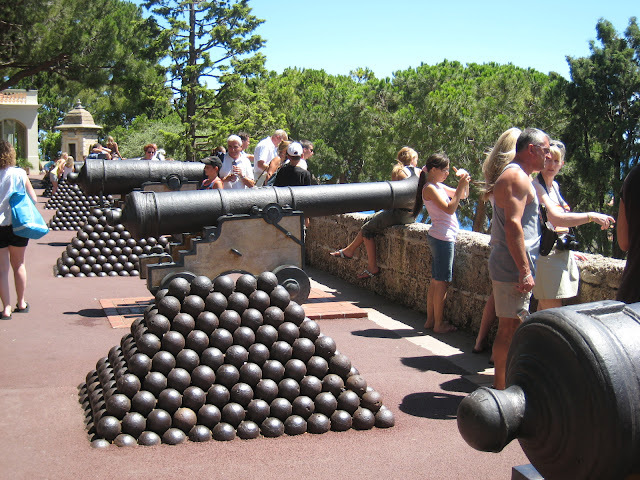 Amidst the cannon and the cannon balls, visitors look down from the Rock, onto the port of Fontvieille. The palace is behind me - and to the left you can look down over the main port of Monaco. Tomorrow, I'll show you another use for cannonballs. This is the back of the Oceanographic Museum and Aquarium. I'll show you a photograph of the front another day. Founded by Prince Albert 1, it was inaugurated in 1910. 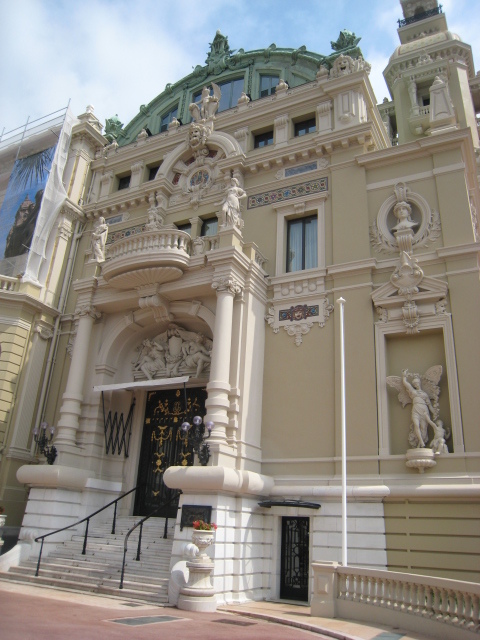 This is an amazing museum of marine sciences and not to be missed if you are visiting Monaco. The building rises majestically from the sea to a height of 279 feet and took 11 years to build, using 100,000 tons of stone from La Turbie, a village high above Monte Carlo. Part of the museum is dedicated to Albert 1, who was a major navigator. Here you'll find his laboratory ships and collections of marine fauna including a skeleton from a 66-foot whale. 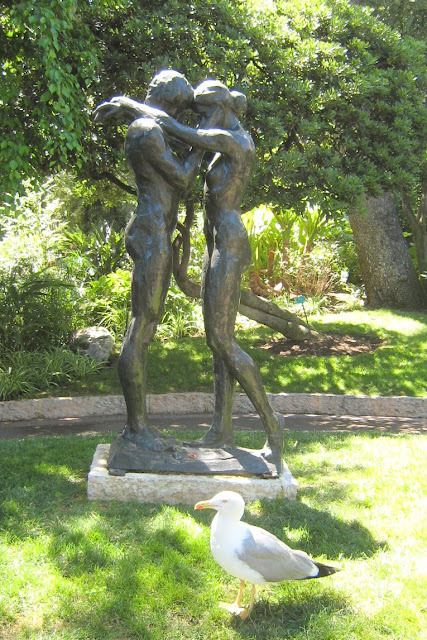 This sculpture called Invitation, by the Dutch artist and sculptor, Kees Verkade, stands in the Jardin Saint-Martin on Le Rocher. 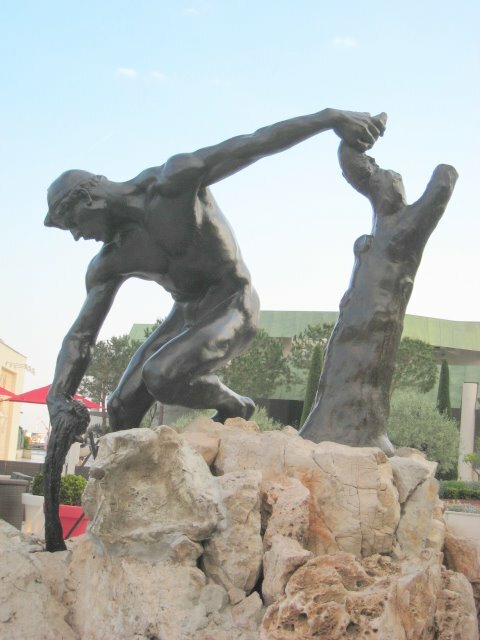 You see many sculptures by this Monaco resident around the Principality and can read more at this link. He specialises in the human form with emphasis on movement and emotion. The gull dropped in for the photograph. 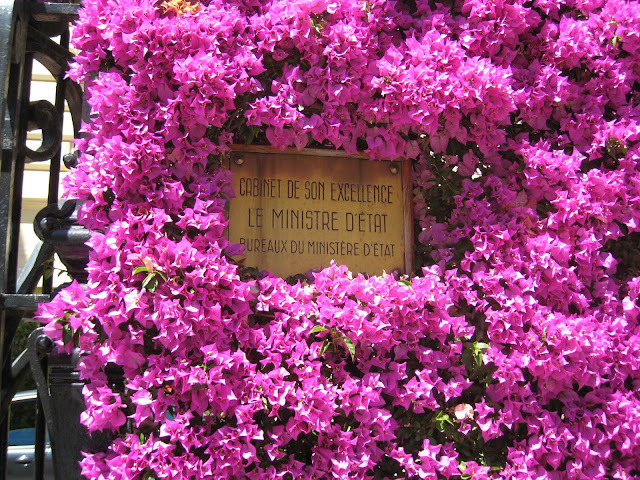 This brass plaque, peering out from the bougainvillea, tells us that here, on the Rock, you'll find the offices of the Minister of State - you can see the building below. The bougainvillea is for Isabella of Naples Daily Photo who loves this plant - see this link. 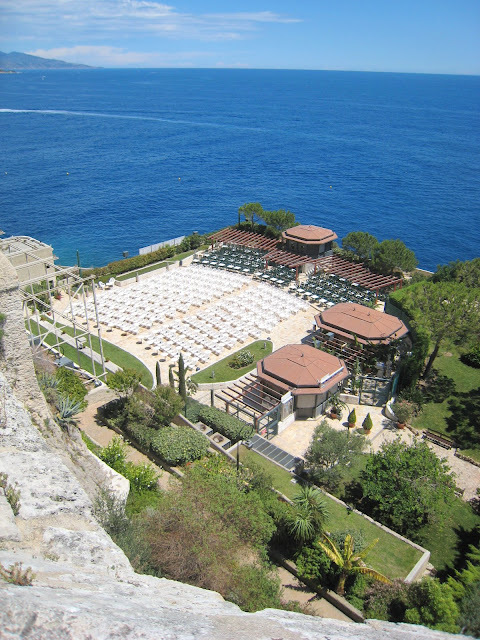 The St. Martin Gardens are on the opposite side of Le Rocher to the main port of Monaco - see yesterday's posting. Here we are, high up on the Rock, looking down to the sea from one of the many beautiful walks through this early 19th century garden. 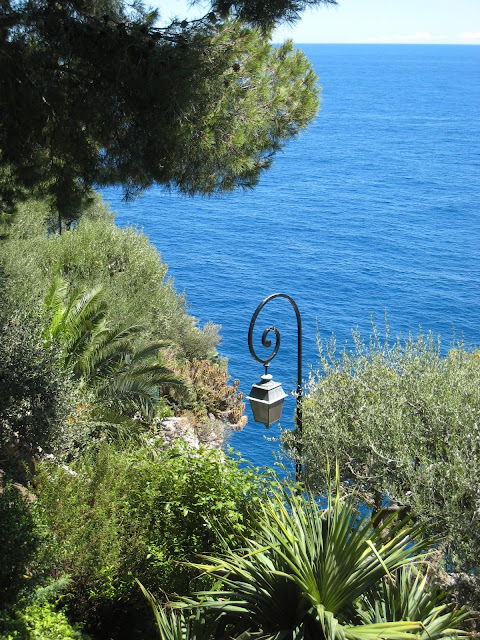 From this position, if you turned your head to the right, you'd see the Port of Fontvieille. 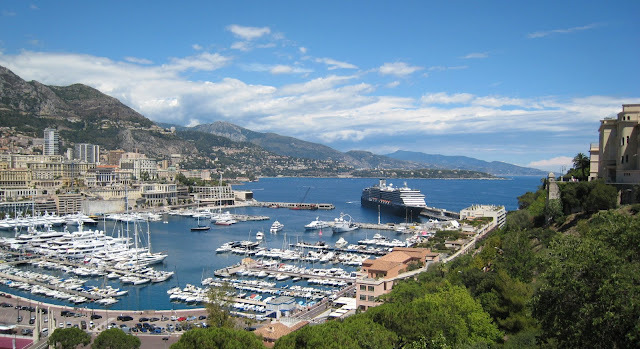 The Port of Monaco taken from Le Rocher (see yesterday's post). Monaco has only fairly recently been able to accommodate cruise liners as large as this, due to the new digue (floating dock). 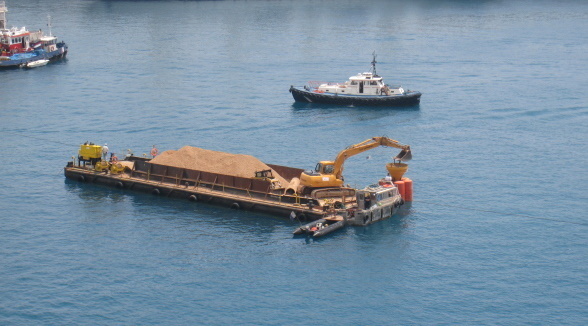 The largest in the world, it was built in Spain and towed to Monaco in 2002. The voyage took 13 days. You can read more at this link. I couldn't see the name of this enormous cruise ship when I took the photograph but driving home past the port, I saw it and by the time I got home had forgotten it - but it started with West...then something or other so if anyone knows? I'd like to know where she came from. This morning I called a friend who lives opposite the port, and asked her to get out her binoculars but she said this ship left yesterday and today there is a new one in port, just as big, but with a white hull this time. Note: Thanks to my friend Laura who tells me this is the MS.Westerdam - read more at this link. We're on the Rock today. 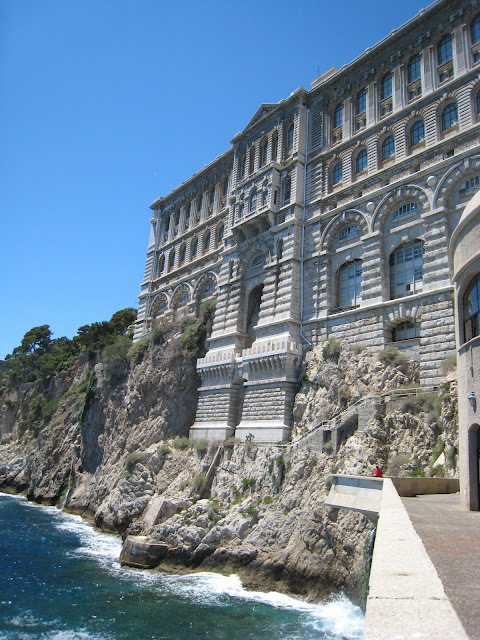 Le Rocher is the oldest part of Monaco and it's where you'll find the Palace, the Cathedral, the wonderful Oceanographic Museum and much more besides. 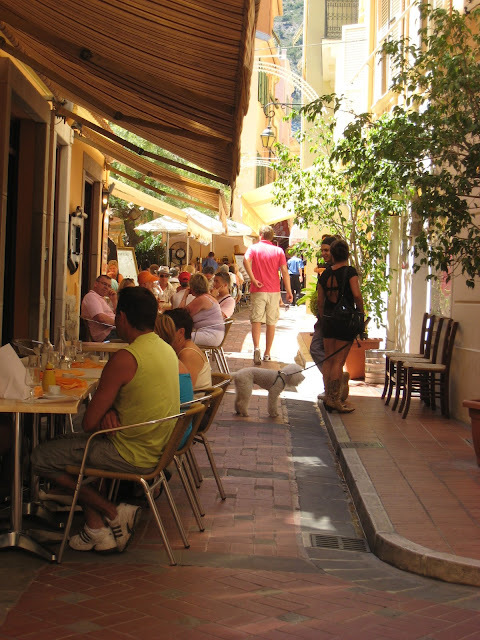 Here is one of the tiny streets at lunch time. 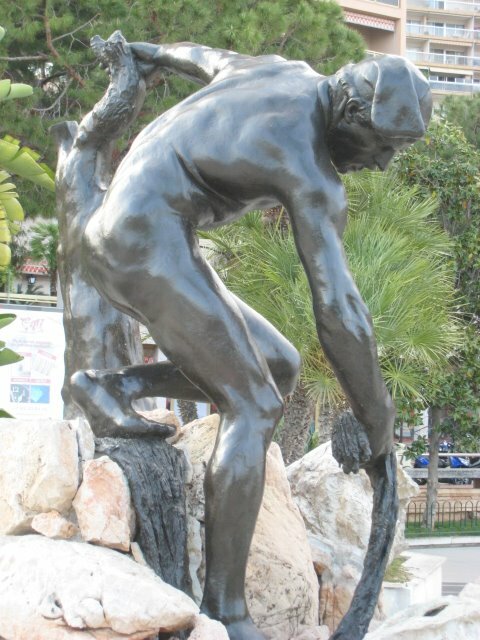 This sculpture (The Fisherman) stands near to Larvotto Beach on Avenue Princesse Grace and was created by the French sculptor, Gustave Dussart (1875 - 1952). 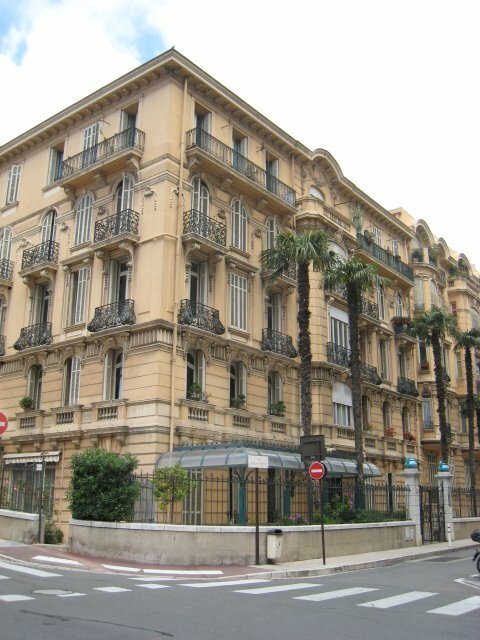 This nicely proportioned building, with its pretty wrought-iron balconies and tall windows, is just behind the police station in Monaco - and one street away from the main port. Probably mostly apartments but there could well be some professional offices - dentists, lawyers, etc. 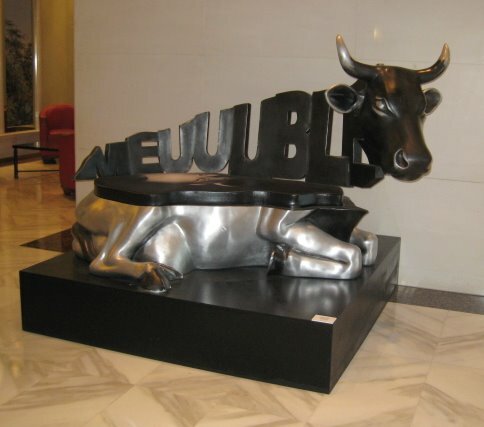 This cow, a piece of art on which to sit, hence its title 'Meuuuble' (Meuble being French for a piece of furniture and uuu being French, presumably, for moo - geddit?!) It's made of white bronze and sculpted by Stéphane Cipre, after a photo by Guillaume Barclay. 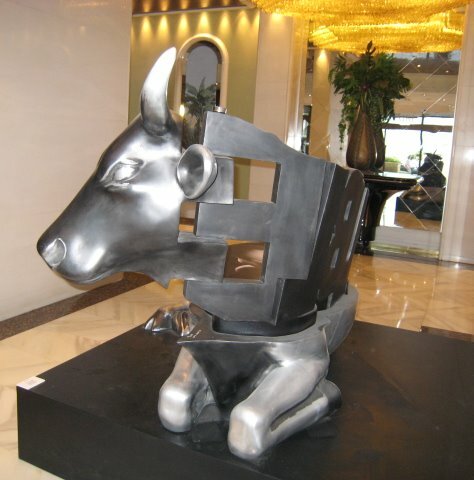 This sits in the lobby of the Columbia Palace, an apartment building on Avenue Princesse Grace, facing the sea. This talented Nice artist created another cow outside Stars 'n' Bars, which you can see at this link. 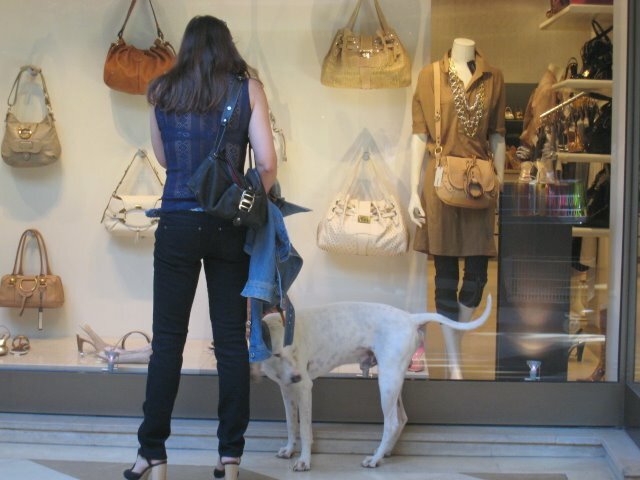 Window shopping - a popular pastime in Monte Carlo. The dog, by the way, is a Porcelaine, a French hunting dog and you can see a better photograph of him here, at Riviera Dogs. This photograph shows one side of the Casino building. The beautiful doorway is the Prince's private entrance to the Opera House. 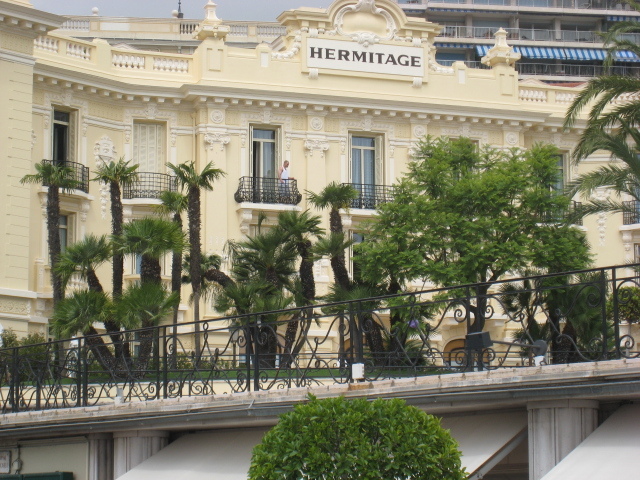 The Hôtel Hermitage is one of Monaco's most beautiful Belle Epoque hotels. Set back from the Casino Gardens, you'll find it at Square Beaumarchais. This is a side view of the hotel taken with my back to the port. 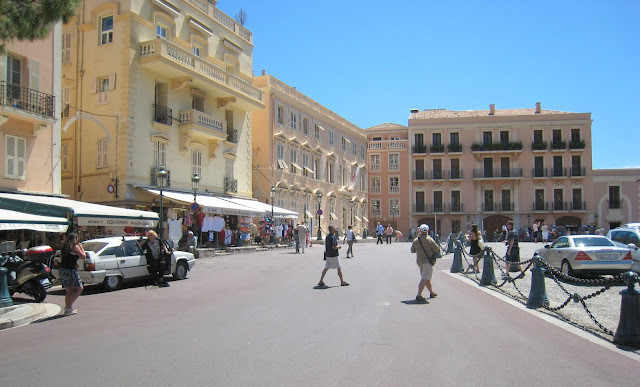 The awnings below belong to luxury shops that line the road leading into Casino Square. One of the most beautiful features of the hotel is the Winter Garden Dome, designed by Gustave Eiffel - and we all know what else he designed. You can read more about this hotel here. You'll also see a photograph of the Dome on the website. 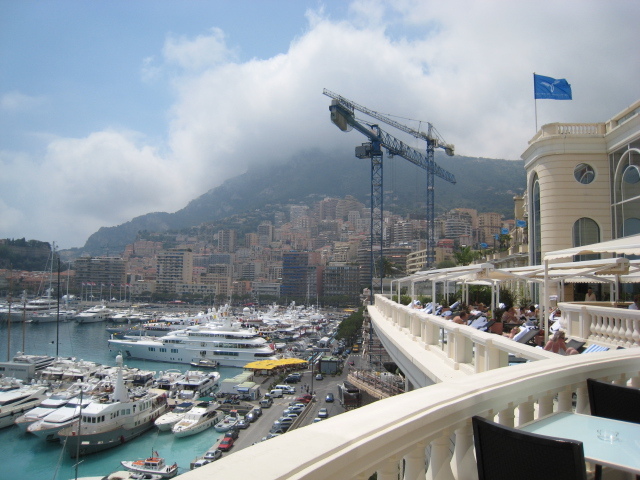 Cloud looms over the harbour in this photograph which was taken from the terrace of Les Thermes Marins de Monte Carlo - you can see a photograph of the pool at this luxurious spa here. The giant crane is a normal sight around Monaco - building work never stops and it has to be said, with all the work going on, it can be a very noisy place to live. 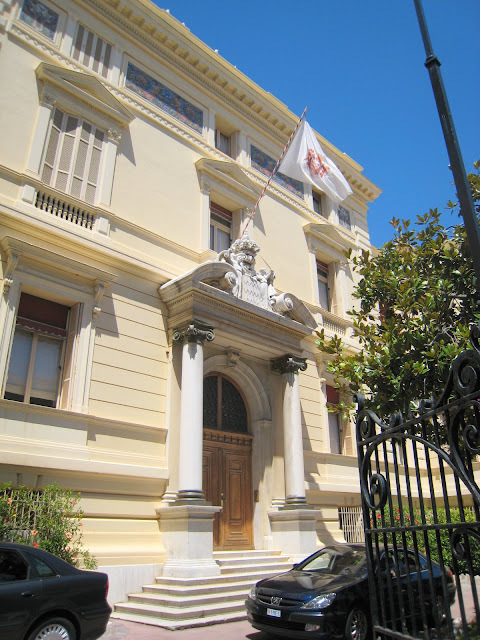 Christophe, from Bastia DP, was in Monaco recently and has posted some beautiful photographs on Bastia DP. Do go and take a look. I'd hoped to meet up with Christophe last Sunday but in the end it didn't work out with so many dogs here. Next time, Christophe, I hope to be able to come into Monaco and have the pleasure of meeting you. 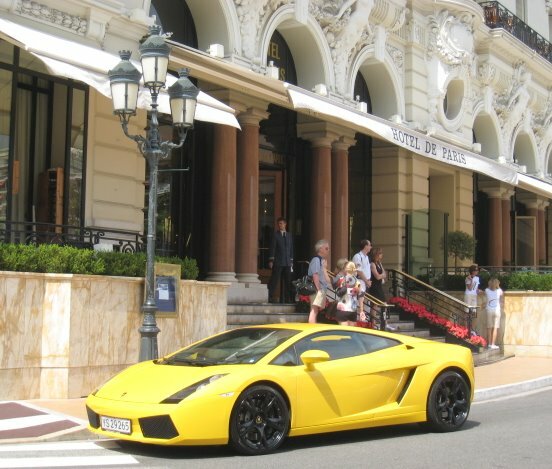 It seems logical, with all the luxury in Monte Carlo, to have a 'cars' section so here's one to add to it. Taken outside the Hôtel de Paris, this is (I think?) a Lamborghini - and if it isn't I know one of you guys out there will correct me! And thankyou to iBlowfish who, on Theme Day, pointed out that the Ferrari was a Ferrari Enzo and to Fabrizio who confirmed it. 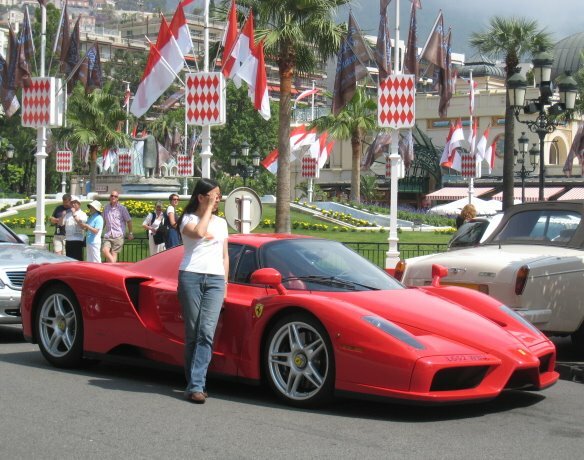 It's so usual to see a Ferrari in Monte Carlo but I knew that one was different! - but didn't know what the difference was. My favourite UK television programme is Top Gear, so I should know these things, shouldn't I? And for those of you not into cars, I hope you enjoy the rather beautiful entrance to the hotel. Building work never stops in Monaco. Drive through and you'll hear the noise of diggers, you'll see cranes everywhere. In such a small area you wonder that it doesn't ever finish, but it doesn't. And nowhere is this more true than on the harbour - here you see how building materials are transported from one place to another. This was an easy Theme Day for Monte Carlo DP. Just take a stroll around Casino Square and you'll find a red Ferrari. You'll also find visitors queuing to pose with the car for a photograph! Mostly men, I might say although I chose to photograph a young lady doing her thing. Do please visit other Daily Photo bloggers who have seen red in their city. A total of 100 are participating in today's Theme Day. You can also take a look at the Daily Photo portal.